Lottery is Over – Customers have been selected. Thanks for entering everyone! If any invoices go unpaid, we’ll pick another customer from the comments. Great job Marq! I really like the pewter paper. Hoping lady luck is with me. Keep up the awesome work. Staying warm in the Rockies isn’t easy! I would love a shot. After striking out for Wood tour and Mexico, I drove to Atlanta to score 1 ticket for 1 night. 1 1/2 hours after the doors opened, I got very lucky to get a ticket. I would love to have something on my wall as cool as this Spusta help me remember that pilgrimage. Such a memorable nigh! Marq, Please enter me into the AE Lotto! Come on baby, got the wall space picked out and everything!!! I went to watch the show from Tokyo!!! I would love to put my name I’m for this, thanks Marq!! Thanks for this opportunity Marq, count me in! LOve this print! Come on lady luck! Another masterpiece by the Best Artist in the world!!!! I would love one of the AE Woods. would look great upon my wall!!!! I would love one of these prints. Looks Great! Please count me in for the lottery! Really excited about this one. Thanks for a shot at a greatness! Never entered your lottery before but feeling lucky today! In like Flynn! Pull my name! Hope I can snag one! Thank you Marq! Thanks for the second chance Marq! Im in ! Love this poster, i didnt make it to denver, but this one is too cool to pass up. Almost wrecked my car 3 times last week frantically hitting the refresh button on my phone while stuck in traffic. Keeping my fingers crossed on this one! Awesome work! Thanks. Marq, Nice work on the panic poster! I’d like to throw my name in there for the lottery tonight. Thanks for all your great works. I would love love love one of these prints!! Thanks for the opportunity! That looks awesome. I would be honored to have it! she really really wants it!! Missed on the drop. Thanks. Please consider this post as my entry to the lottery. Thank you vey much for the opportunity. Thanks again for doing this Marq! Would love a a chance at any of the variants or AE! Count me in. Would love to get one of these. Thanks, Marq! Much Respect, Marq. Thanks for the opportunity. Hopefully, I was not too late getting on my ‘puter, because I really, really, really want a Pewter Panic with all those hues of blues that are sure to make me smile, smile, smile every single time I walk by this amazing piece!!! Keep up the good work, Mark!!! I would love to get one of these. Was at the shows in Denver, got there late and was shut out all 3 nights. thanks marq! Thank you so very much for making these available. I missed out on getting one all three nights. Keep up the great work! Throwing my name in the hat!!! marq, def interested in the WSP Wood A/E. Please consider me for one…thanks, Marq! Love the lotteries, Marq!! Here is my shake of the dice. My boyfriends 30th birthday is around the corner and he wasn’t able to snag one at the show…this would make an awesome bday gift! Thanks for the lottery chance! Awesome Print Keep up the good work really hope i win a chance to get one of these. Gotta play the game to win! Ya mon count me in if lady luck shines her light on me!!!! Pewter paper came out GREAT! Sold out SUPER fast at shows and my computer FAILed me last week. This sure would make my week!!! would love a shot at getting my hands on one of these beauties! PayPal didnt load fast enough last week, got shut out. Hoping for a winner…. No whammies… No whammies… Thanks Marq! worth a shot! love this poster!!! After getting shut out, all 3 night’s at the show (and the 12th being my b-day), as well as the artist eddition sale. I’m just happy to have one more shot with the lottery. Thank’s marq, love the work and keep it up. Count me in! Thanks Marq! To purchase any at the shows. I would REALLY love one of your prints. 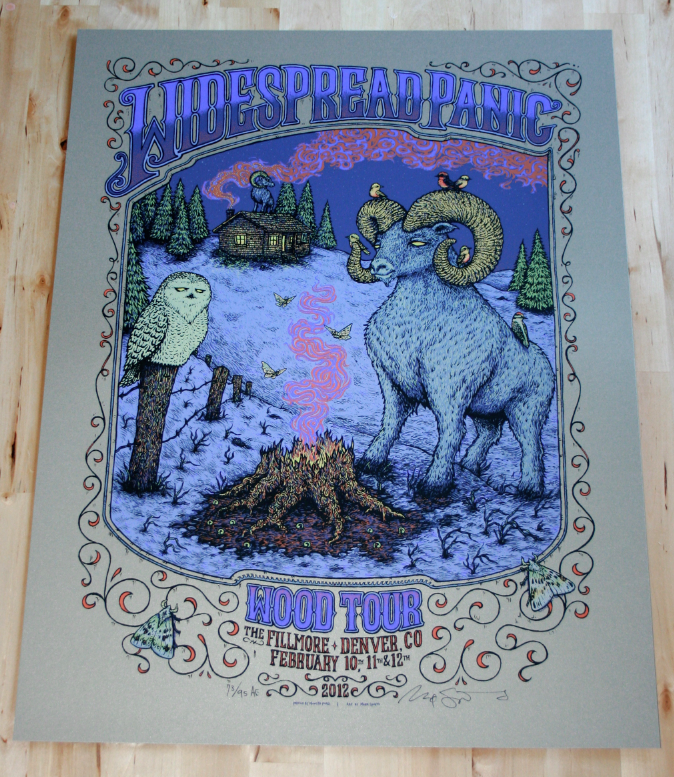 My family would display it with pride… Thanks again for some great artwork to represent WSP on their wood tour. Are my odds better with this lottery or the Mega Millions? Love this poster Marq! Fine job! Hi Marq…thanks for opening up this lottery. Please included me. As a bighorn biologist and big widespread fan, this would really be a meaningful piece of art to hang in my office. Beautiful weather in Chicago today! Would love an opportunity to purchase one of there. Fantastic work Marq! Super tight! Having one would be my delight! Pleas! count me in… ‘course, as the 2/12 Sunday Night Encore reminds us: You Can’t Always Get What You Want. “It’s only real if you believe” … I BELIEVE! Love that u do this Marq..Im in..
Thx for the lotto Marq!! 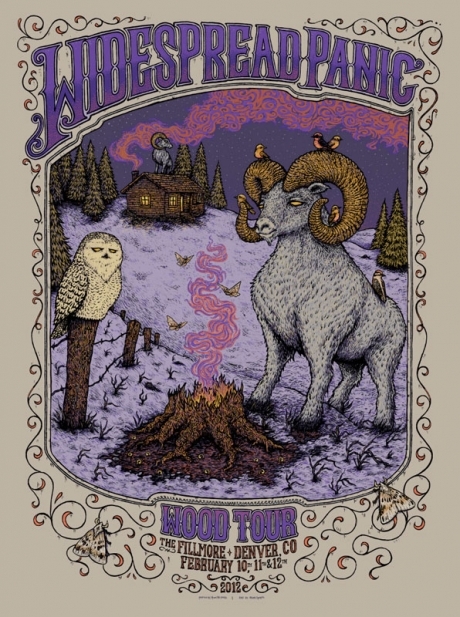 Really killer poster for WSP’s Fillmore show. Wish I could have made it., but I was down in Telluride. Hopefully the rest of that tree from the stump was put to good use, like Marq Spusta posters. Ha- thanks for the lottos, always alot of fun! the pewter paper is so sweet! Love the pewter paper, Marq! Thanks, again! Would love to win one! I want one, thanks for the chance. I hope I win! Thanks they look great! Crosseyed & Painless, I’m still patiently waiting to be selected from either your lotto or Tyler’s lotto (or Phish PTBM lotto). Would love the chance. Thanks! I have my fingers and toes crossed for a chance at this print! Thanks for the second opportunity marq! Thanks for the chance to win this awesome poster. I wake up every morning to your 2010 wsp halloween poster – great poster for great shows. This poster and shows are equally as great! Fire in the stump is SICK. Love the color choices on the bark and ground around it. Thanks for the chance to buy one! Hoping to add this to my other wood tour collection! Hoping for an Wood Tour AP. I would love to get this print!!! Was working when they first went on sale. Thanks for the second chance!! Count me in. Good luck guys! Would love to have this hanging on my wall! Thanks for the opportunity. Can’t wait to be picked because I am FEELING LUCKY! I feel like im in Vegas, except the prize is way cooler. Love me some WP. Great poster Marq!!! This banger will look so tight with the matching tatt I just got done on my back! Love this print Mr. Spusta! Thanks for the chance at purchasing. This show crapped a rainbow in my brain. Let me get one please! Sickest poster! Would love to have it! One lotto ticket please. Thanks Marq! Really Kickass print Marq!!! Thanks for the chance to score one!!! Good luck all! Grate work as always! Hope today is my lucky hump day! Get funky with it! I likey! Managed to miss both of the lotteries today. If any invoices go unpaid, and you need another winner, I’m here for you. Love the Pewter Paper Panic Print. Perfect Poster!